Since 1982, the Discovery™ Channel has brought beautiful and exotic wildlife from around the globe into people's homes. 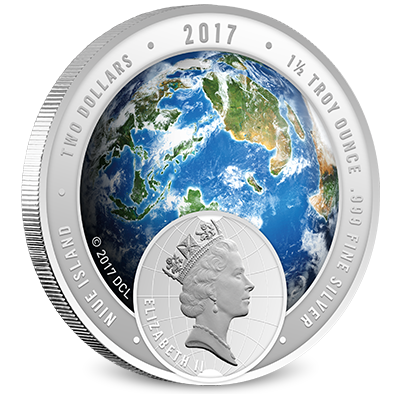 2017 saw the release of the second in the Discovery™ Endangered Species proof silver coin set, focusing on the endangered wildlife of Asia. 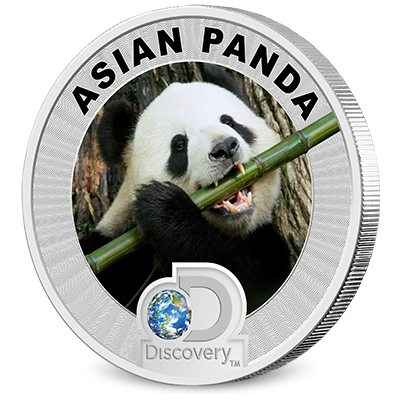 The Discovery™ Endangered Species Asia Silver Coin Set features photo-realistic images of the Asian Panda and Asian Orangutan, each on 1.5 troy ounce legal tender coins. Presented in a custom presentation case in the form of a world traveler's valise, this two-coin proof silver set totals three troy ounces of .999 silver. 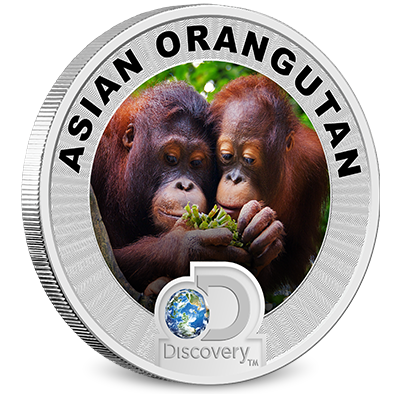 Only 700 Discovery™ Endangered Species – Asia silver coin sets will be minted. Pandas are a species of bear native to the Qinling Mountains of central China. Special adaptations to their digestive systems allow them to survive on a diet that is almost entirely made up of bamboo. Pandas eat 20 to 30 pounds of bamboo shoots and leaves daily. The low nutritional value of bamboo leads the panda to forage almost constantly. Deforestation and poaching are the main causes of panda mortality. However, the international popularity of pandas today have incentivized Chinese authorities to protect their habitat. The International Union for the Conservation of Nature (IUCN) raised the status of the panda from endangered to vulnerable in September 2016. The Orangutan is the only great ape living in Asia. Covered in red-brown hair and impressively intelligent, they are known to use tools to gather food. Compared to chimpanzees and gorillas, orangutans spend most of their time in trees, away from predators. The habitat of the orangutan has shrunk to small tropical rain forests on the islands of Borneo and Sumatra in the South Pacific, which are under constant threat of deforestation. With the longest reproduction cycle of any mammal, orangutan populations are devastated by poachers who capture infants for the illegal pet trade. The International Union for the Conservation of Nature (IUCN), lists the Orangutan as critically endangered. Every set in the Discovery Endangered Species silver coin series is safely housed in a handsome presentation case constructed to resemble a traveler's valise. 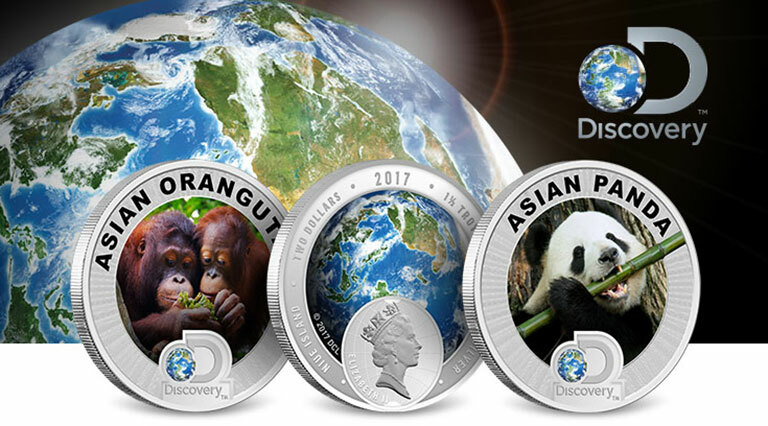 The display case and packaging of the 2017 Discovery Endangered Species Series - Asia truly brings this two-coin set together. The display case features a clasp and is decorated on all of its surfaces by a classic-style world map. The certificate of authenticity (COA) is included, individually numbered, and personally signed by the designer. Beyond their message of preserving our planet's most endangered wildlife, these 1½ ounce silver coins also exhibit remarkable aesthetic quality. The gorgeous, full-color designs were an in-house creation by Gainesville Coins' own Putri W. Ritter. In vibrant colorization, the real-life images of the Asian Giant Panda and Asian Orangutan pop off of the coin's surface. Moreover, these coins are officially licensed by Discovery™ and are legal tender of the Government of Niue Island.